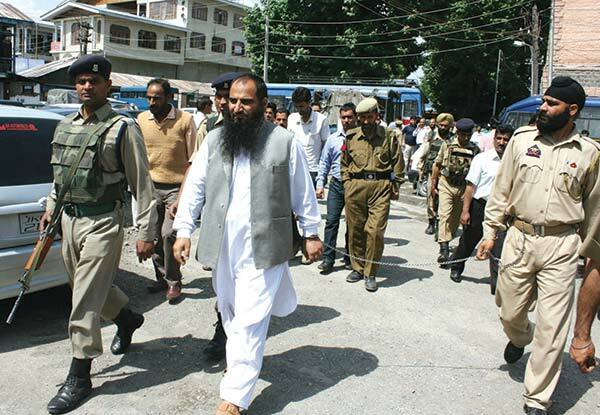 The incarcerated chairman of Muslim League Jammu and Kashmir Masarat Aalam Bhat was on Tuesday brought from Kot Bhalwal Jail, Jammu to Srinagar for the hearing of a case lodged against him in police station Nowhatta. Aalam was produced today before Additional District and Sessions Judge where after hearing the arguments, the judge fixed the next hearing of the said case on June 2, a League spokesperson Sajad Ayoubi said in a statement. He said after hearing, Masarat was taken back to Kot Bhalwal Jail. He said that state, as well as the central government, set new policies and methods for the continued imprisonment of Masarat Aalam under “baseless” cases, which is “worst kind of human rights violation and highly condemnable”. The spokesperson said that government is deliberately doing it under a plan so that Aalam is not released by the court. He said that prolonging the “illegal” detention of Masarat showed government’s “frustration”. The policy adopted by the government through which Masarat is being moved from one police station to another cannot break his will and courage, he added.